The Robert Ferguson Observatory (RFO) is open to the public at least once a month, usually on a Saturday near the time of the New Moon. Star Parties: Presentations on astronomical topics are given in the classroom throughout the course of the evening. Starting at dusk, the Observatory’s three main telescopes are open for your viewing. Docents set up additional telescopes in front of the building. Friendly and knowledgeable docents are available to answer your questions. When to arrive: We keep the observatory open as long as there are visitors, but you must arrive within 3 hours after start time to ensure that we remain open for you. Summer Star Parties begin with tours and presentations until it’s dark enough for observing. Bring warm clothing, even in summer—observing is done outdoors. There is a short walk from the parking area to the Observatory and you may wish to bring a small flashlight. ◦ Bring a SMALL flashlight (large camp lanterns, light sticks, etc., cannot be adequately covered by red cellophane). ◦ Cell phones or cell-phone flashlights are acceptable but must be covered in red cellophane. (No cell service at the observatory). ◦ Some head lamps are difficult to cover with red cellophane. Once covered, head lamps should be worn around the neck or used pointing down as they are usually very bright at eye level. 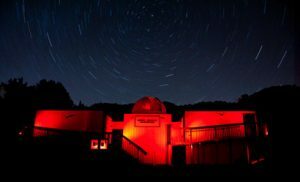 ◦ Red flashlights are available for $5 at the observatory. Alcohol is prohibited on Observatory grounds. The Observatory is not open to the public except for scheduled events. Classroom presentations are always offered on Star Party nights even if the weather is poor. For current conditions call the observatory at 707/833-6979. For more info please visit Robert Ferguson Observatory Website: http://www.rfo.org/.